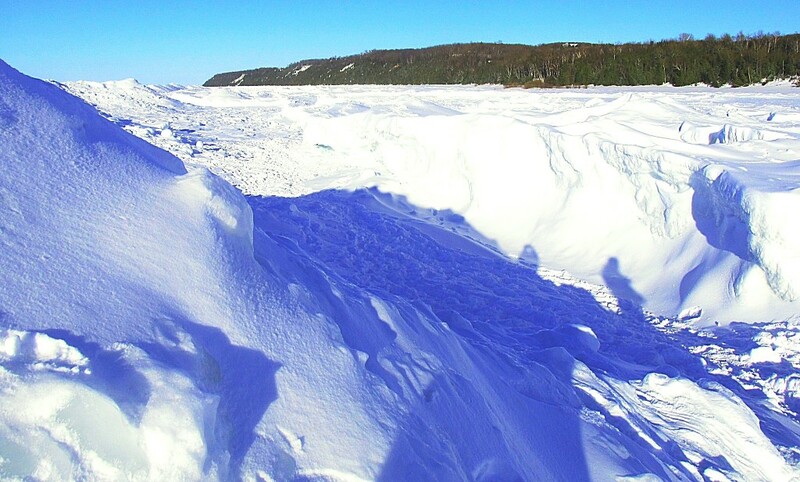 LELAND, Mi — The northern Michigan winter this year, with its Arctic cold and persistent snow, has locked Lake Michigan’s shoreline in towering walls of ice. It’s a frozen grip. The gales of January and the calmer winds of February, shifting from stout to steady, pulled the water and pushed the ice until it careened upward and outward, forming pregnant walls and bridges that birthed big caves. Yesterday, gloriously cold and sunny, hundreds of people gathered north of this Lake Michigan shoreline village to explore the icy landscape, a rare example of the water’s warp not likely to be seen again anytime soon. 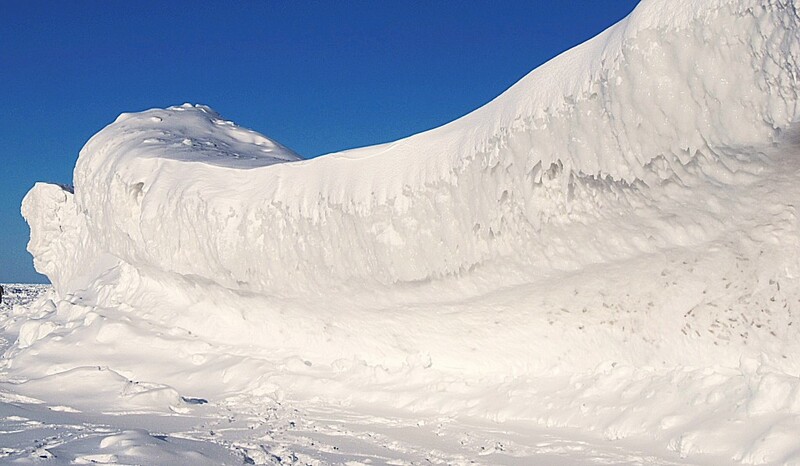 Children and dogs slipped through crevices and slid down the steep faces of icy walls. 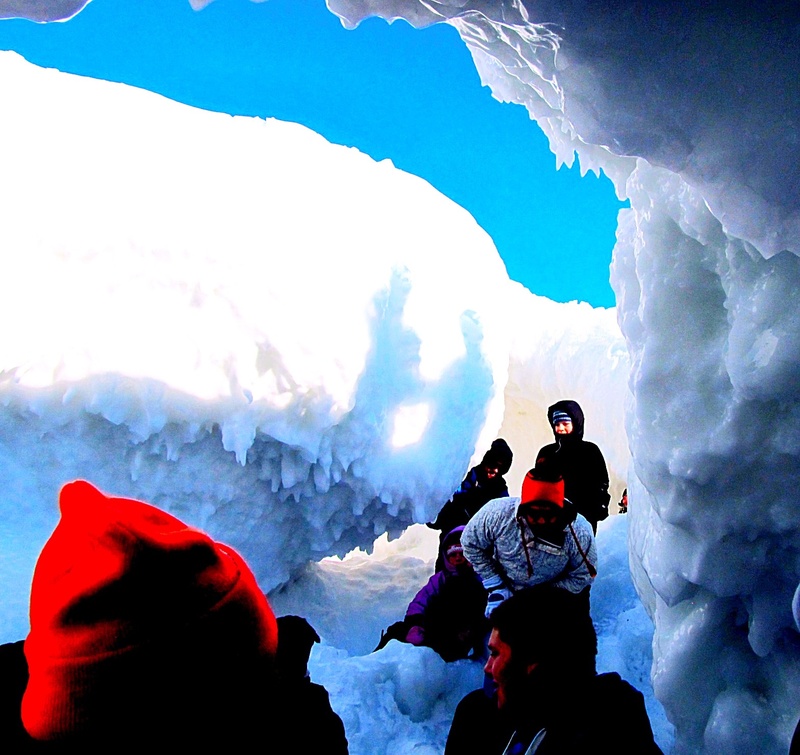 Older people carefully navigated the ice, peering into caves, and settling onto sun-washed ice shelves that were out of the wind where it was surprisingly warm. Everywhere there were smart phones and digital cameras documenting the kids, the families, the pretty girls, smiling and draped on the ice. Indeed, it was a day to celebrate the beautiful place where we all live. The sculpted formations, edged smooth, rounded by the wind, were painted by a bright sun — brilliant white, deep blue, and shades of aqua marine. Snow, of course, has a perfect memory. Each winter here it finds the same gullies to fill, the same stream beds to cloak, the same trees and rocks and fields to cover. But it’s the depth of the snow, and the ice, that’s different this year. Snow is almost 4 feet deep in my backyard and has formed a pillow on my deck that’s chest-high. 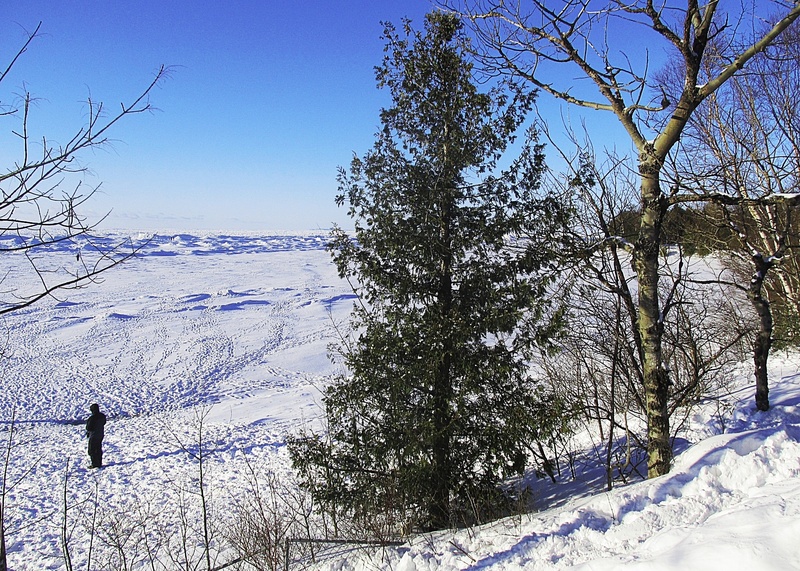 The ridges along the highways formed by the snowplows are frequently much taller than a man. Mountains of snow are piled in parking lots. The Betsie River is frozen over. Frankfort’s concrete breakwaters are frozen over. Lake Michigan is a table set nearly completely with ice, as are the other four Great Lakes. 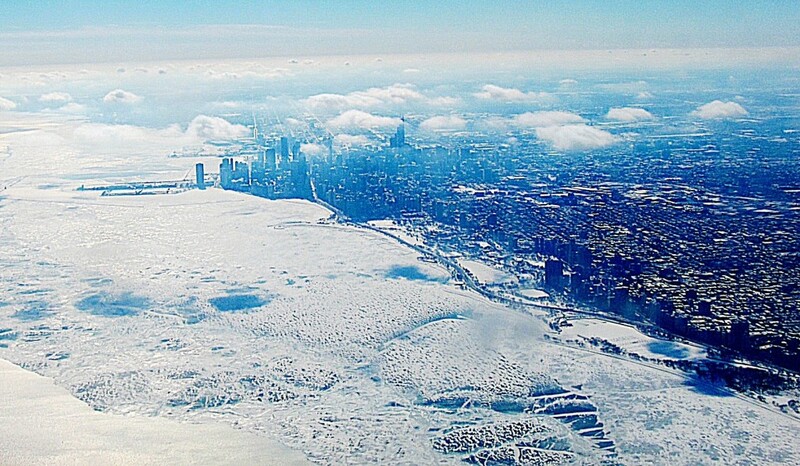 I flew across Lake Michigan almost two weeks ago and saw Chicago locked in ice, and a white blanket, 100 miles wide and nearly 300 miles long, draping the big lake from shoreline to shoreline. The last time I saw that was in 1994, a much different period in my life and the life of this region. Thick blows the frosty breath of winter in northern Michigan. It’s the season when nature’s power is supreme, when people understand more completely how their time, their lives, are wrapped into a mighty scheme. This winter, gusty and so full of snow, has made that lesson even more evident. Winter this year has been variously stout, even monstrous. At times it’s been dark and treacherous. Yesterday, though, winter was full of the shrieks of children awed by the ice, playing beneath a deep blue sky, perfect and strong. 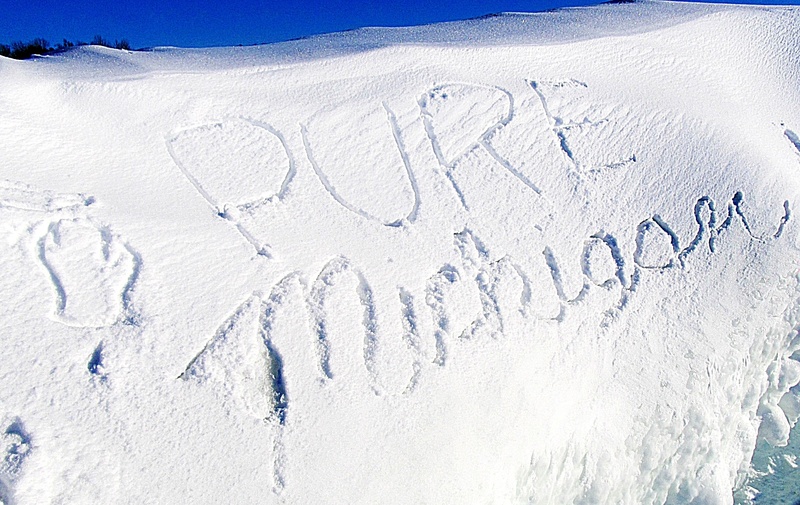 Forgive me, but a sign and a map carefully drawn in the snow said it all: Pure Michigan.